This novel shattered my heart into a million pieces and made me laugh more than I have in a long time. From the first pages The Fault in Our Stars I was laughing and I fell in love with the character of Hazel. I loved her brutal honesty, her train of thought and just how normal she tries to be. It wasn’t until I finished the novel that I realised just how much of a good job Green had done at getting into the head of a sixteen year old girl with terminal illness. There were no flaws in her monologue, decisions or actions. I felt that Hazel was real, at first I was a little taken aback with how mature she was about dying but this is not uncommon in novels of this kind. These types of novels have been dubbed ‘sick lit’ by the press which I think is just pathetic and immature. The novel isn’t out to ‘glamourize’ death or terminal illness and I think it is an insult to the tireless research authors. In a nutshell this novel is about falling in love, having hope, excruciating loss and life after death. I’ll admit that at first I was incredibly sceptical of the love life between Hazel and Augustus. I rolled my eyes a little when the beautiful boy turned up to take her troubles away. Usually I would have been able to put the novel down at this point but Greens charm made it so that I could not walk away ( I seriously mean that, I took my Kindle EVERYWHERE until I had finished). There is something unique in the relationship between Hazel and Augustus. Some may be sceptical but how do we know how we would act if we were in love and time was running out? The one way I can tell if a novel is worth reading and passing on is if the characters are still walking around my head a week after. You wonder endlessly about them, as Hazel does herself in regards to her own favourite novel, An Imperial Affliction, with that ending (see now you have to read it to understand what I’m on about). I still think about the characters and have endless questions for Mr Green if I ever had the pleasure of meeting him. The characters really do come off the page, I feel like they were my friends and at certain points I had to stop and fight off tears by the pool side (especially as I had an outburst of ‘No!’ with absolute agony in my voice making my family look at me very strangely the day before). It felt like just as you were getting to know the characters and thought you knew how they were going to act and what they were going to do you were thrown off balance and had to revaluate what you previously thought. 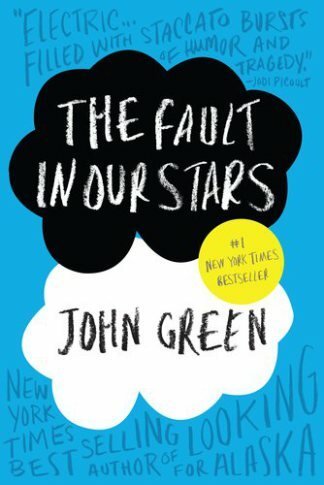 I feel that the relationship between Hazel and Augustus has been portrayed in a very interesting light. Green has not set out to prove that a teenage love lasts forever, nor does it make everything better which I believe adds to the magic and reality of the novel. It is not only the relationship between Hazel and Augustus that is explored within The Fault in Our Stars there is the relationship between Hazel and her parents. It is rather incredible that Green has not stuck to the stereotypical parents in many aspects. I cannot spoil the plot for you but Hazel’s mum is not as clingy as she seems. Green has instead portrayed an emotional father and a mother who is not pressuring her to pursue endless treatment; she wants her to have a life. It is because of her parents that she finds herself in the support group for cancer and although she hates it by the end you can see their logic and the effect of Cancer on the family unit, they deal with it the best they can. The reader also experiences the world through the eyes of a cancer patient and Green goes as far as to make a point out of the Cancer Perks which the characters themselves do at times find amusing, for example Augusts’ driving skills. I was surprised to find that the novel did not depress me, yes it made me sad and I felt heartbroken but it also made me appreciate the struggles of people with Cancer as well as inspiring me. As a writer who is researching terminal illness I found Green’s ability incredible as well as his empathy with his characters. There is a point in the novel which I found to be both beautiful and brutally honest in regards to the previously mentioned ‘Cancer Perks’. I will not spoil the plot for you but I will say that Green makes it clear that even when you have Cancer the world can still screw you over, making the characters more normal. I will give this novel five stars ***** it really is a unique novel and I urge everyone to read it or at least try it.